Breast Implant Illness: Are Your Breast Implants Making You Sick? Breast Implant Illness is the name given to various symptoms and illnesses reported by women who have experienced adverse health conditions and chronic problems with their health after implantation. There has been a great deal of controversy and unanswered questions regarding breast implant illness and the safety of breast implants especially after the recent FDA confirmation of the risk of breast implant-associated large cell lymphoma, a rare version of non-Hodgkins lymph cancer. Researchers have found that women with silicone gel-filled breast implants that had ruptured were significantly more likely to have fibromyalgia, polymyositis, Hashimoto’s thyroiditis, pulmonary fibrosis, eosinophilic fasciitis, and polymyalgia. Many patients also had symptoms of biotoxicity from mold, fungus and yeast overgrowth due to an immune deficiency, which is common in any patient with leaking or ruptured silicone implants. Infection appears to be a huge problem with the saline implant population that becomes ill. The infection can be around the implant, which is often exacerbated by the patient’s breastfeeding with the implant in the submammary position or it can be within the implant where bacteria or fungi are found in the implant with a valve leak. Women who became ill from mold in or around their smooth saline breast implants experience what is called biotoxicity, a condition resulting from mold growing inside or around leaking saline implants. Dr. Ritchie Shoemaker, author of Mold Warriors suggests that this condition is equivalent to having sick building syndrome inside of one’s body. Women with breast implants often suffer from silicone toxicity, chemical toxicity and chemical sensitivity, biotoxicity and heavy metal toxicity. They often have methlylation and detoxification defects as well as coinfections (yeast, mold, viruses, parasites, bacterial and intracellular infections). Immune problems, hormone imbalances, autoimmune disorders, and neurological issues have also linked to breast implant illness. —Breast implants are foreign plastic objects that the body and immune system can reject. Regardless of whether the implants are saline or silicone, all breast implants are composed of a silicone elastomer capsule (the capsule shell of the implant). The capsules are biologically foreign to the body, are often coated in highly controversial nanoparticle silica, and result in rejection by the immune system in up to 12% of all cases. —Autoimmune disorders. Leaking and ruptured implants are associated with fibromyalgia, chronic fatigue syndrome, Raynaud’s, lupus, scleroderma, rheumatoid arthritis and elevated thyroglobulin antibodies and thyroid peroxidase antibodies (Hashimoto’s thyroiditis). —Capsular contracture. After implantation, scar tissue known as the “capsule” forms around the implant. This scar tissue tightens and squeezes the implant causing the breasts to become hard, visibly distorted and painful. Capsular contractures are believed to be the result of a low-grade infection around the implant. —Unexplained hives, itching, sores and rashes (a very common symptom among implant sufferers). Skin rash is listed by the FDA as a potential adverse reaction from implants. —Bio-toxin illness and biofilm disease. Bio-toxins from mold in and around the breast implants are neurotoxins that can cause numbness, weakness, blurred vision, headaches, dizziness, cardiac arrhythmias, pain, muscle twitching, and seizures if the implant is infected. —Hormonal problems. Silicone is estrogenic in nature. Endocrine symptoms occur because of silicone, chemical or bio-toxin activity that acts as an endocrine disruptor. Women with ruptured and/or leaking silicone gel implants can have increased problems with fibrocystic disease, ovarian cysts and uterine fibroids. —Valved saline implants are associated with serious bacterial and fungal infections. Candida overgrowth and dysbiotic bacterial problems such as periodontal disease, sinusitis, bladder infections, bronchitis, H.Pylori infection, and other bacterial infections can become more prominent and more difficult to control. —Increased risk of cancer including brain cancer, bronchial cancer, skin cancer (non-melanoma), lung cancer, cervical cancer, vulvar cancer, and most recently anaplastic large cell lymphoma (BIA-ALCL), a rare version of non-Hodgkins lymph cancer. In 2005, I had breast augmentation surgery with silicone implants. Little did I know that the breast implants would literally nearly kill me. I was told I was depressed. I was tested for MS and Lyme disease. My plastic surgeon told me to find another reason for my illness because my implants were not the reason, even though they were so severely ruptured you couldn’t tell they were implants anymore. I had too much natural breast tissue to see an issue. I had to see a different plastic surgeon to have them removed. My implants were probably ruptured for at least three years, but I experienced symptoms for at least six of the nine years that I had the implants. I had excessive weight gain (regardless of healthy eating plan), severe pain, heavy metal toxicity, cooked adrenals, severe thyroid problems and other hormone problems, sores, rashes, hair loss, and an anaphylactic episode requiring an ER visit, Epi and steroids. The list goes on and on. After having the implants for 9 years, I explanted in April 2014. I am just now starting to feel better (April 2017). I couldn’t be happier that I had them removed. After I explanted, I did a provocation allergy test to silicone and my throat closed, my heart rate shot up to 180, and my BP went to 210/100 (normal for me is 110/60). Compared to women with saline implants, women with silicone implants were almost twice as likely to experience capsular contracture (scarring around the implant). In the same month, an Israeli study of tens of thousands of women also discovered a link between breast implants and autoimmune diseases. Several smaller studies conducted in recent years in the Netherlands and the U.S., reached similar conclusions. When saline or silicone implants begin to leak, the first symptom is immune dysfunction. Most women develop symptoms of systemic Candida including muscle aches, fatigue, hives and brain fog. Implant patients also tend to have a variety of viral infections including Epstein-Barr and herpes. When capsular cultures are performed, approximately half of the explants have infections such as staphococcus, pseudomonas, Enterococcus, and a multitude of other organisms including different types of fungi inside the implants seen on microscopy including aspergillus. Breast Implants and Genetics. If you have an HLA-B27 or HLA DR53 or 54 gene, you should avoid all silicone and saline breast implants as the probability of getting ill with autoimmune disease shortly after implantation greatly increases. Symptoms include chronic fatigue, joint aches, nodules, rashes, increased thyroid antibodies, and an elevated ANA. If you have an MTHFR defect (involving defects in methylation and detoxification), you should avoid silicone gel or textured implants as you will not be able to detox the chemicals and silicone that come through or off the shell. These patients usually become ill within a few years of implantation, or after the shell undergoes a lipolysis reaction in the body at about 8-10 years and the silicone starts to leak out. Biofilms and biotoxins. Fungus growing in the implants produces a biofilm also known as a biotoxin (which is also a neurotoxin) that affects about 25% of the population due to a susceptible genetic (HLA) type. The symptoms of fibromyalgia related to breast implant illness may be the result of chemical toxicity from the silicone gel or the textured silicone elastomer (the container that holds the saline) or bio-toxicity from mold. If you have problems with biotoxin detox with mold exposure, you should avoid saline implants as mold in or around this implant is very common. If you have a history of fibromyalgia, intracellular infections such as mycoplasma, Lyme’s disease, or a history or a family history of autoimmune disease, you should avoid implantation. Breast augmentation is a multi-billion dollar industry for participating manufacturers and doctors. For some women, it’s a potential, scientifically proven nightmare. Ultimately, the choice is yours. Do your homework and educate yourself on the potential risks before deciding on breast implants. There is also a private breast implant illness facebook group that provides support for women who have explanted and for those with breast implant illness. If you’re experiencing any of the above symptoms or have been diagnosed with an autoimmune disease, having your implants removed may provide the relief you’ve been seeking. Explant surgery to remove breast implants, the capsule and surrounding areas can be lifesaving for some women, although the procedure is no walk in the park; it’s complex and must be performed by a highly skilled and experienced surgeon. If you are experiencing complications or unresolved health challenges since breast implantation or believe you’re suffering from breast implant illness or have undergone explant surgery, I can help you! 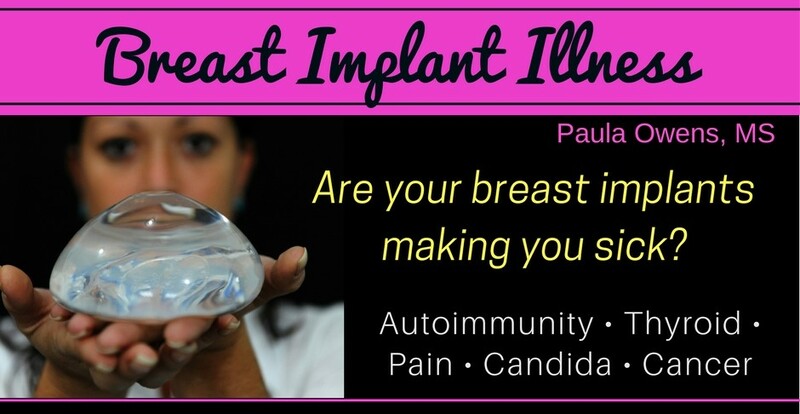 If you know someone with breast implants and they’ve been diagnosed with an autoimmune disorder such as lupus, Hashimoto’s, rheumatoid arthritis, Sjögren’s syndrome or have had autoimmune-like symptoms after augmentation, have them contact my office. A holistic and integrative approach works best, as silicone and saline breast implant disease is truly a holistic illness, with the necessity of the practitioner understanding functional medicine, holistic health, bio-individual clinical nutrition, safe and effective detox protocols, and building a strong immune system and strong healthy foundation. Schedule a free 15-minute consultation. Video: Is a Hidden Infection the Root Cause of Your Health Problem?